Daykins Row was built sometime after 1824 but before 1834, on land once owned by the Marquis of Ormonde. The name of Daykin (sometimes spelt Dayken)has been associated with Codnor for many centuries. Local records show a John Daykin in 1543 and a Christopher Daykin in 1724. It is thought Daykins row was named after a mining agent called John Daykin who died in 1831. 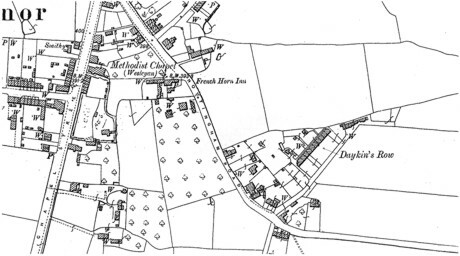 Fig.1 A map dated around 1900, showing the location of Daykins row just off Nottingham Road. I recall my Granddad telling me that he had a paper round in Codnor when he was about ten or eleven years old just after the first world war. He used to dread getting to Daykins Row were there was a short lane that led to the back of the houses. It was here were he used to run the gauntlet of vicious dogs and youths wanting a fight. Numbers 11 and 12 stood apart from the row and housed the Bradley’s and the Searson’s. Nothing remains of the row of houses but the two cottages at the end of the lane are still there. During the early 1950s when I was aged between five and eight, I lived at number five Daykins row with my parents and two sisters. 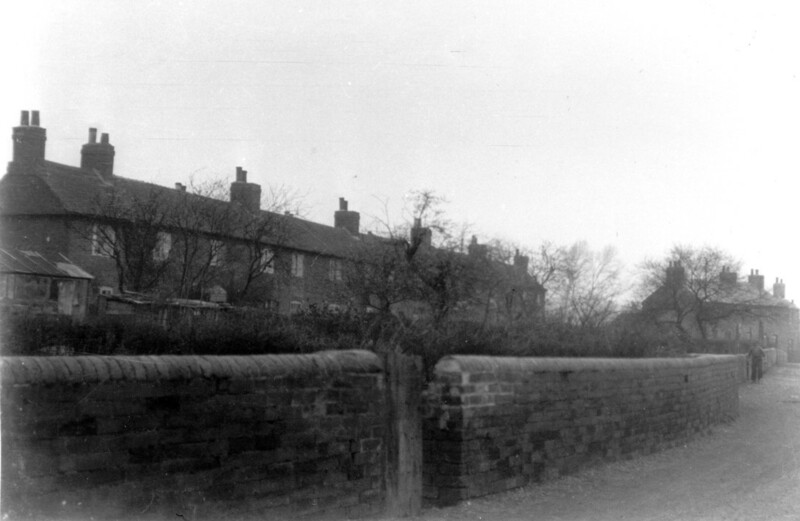 The houses were terraced two-up two-down’s with walled allotments in front and a garden at the rear separated from the houses by a paved area that ran the whole length of the row. Access to the back of the houses was via a short lane by the side of number 1. The living was quiet basic with no electricity or hot water and a WC out on the back garden. I seem to remember the toilets being in three blocks, two blocks of four and a block of two, all with a wide gap under the door. The house was quiet cramped for the five of us and I remember once being confined to the small ‘landing’ space at the top of the stairs during a bout of Scarlet Fever. We used a ”Kelly” lamp to light the way to bed and on a cold winter’s night, extra blankets or dads Greatcoat were used to try and keep warm. Lighting was by gas mantle and cooking done on a gas ring. All the houses were fitted with a gas meter so I was frequently asked to call on our neighbours to see if they had a shilling change for the meter. We did have a wireless that was powered by a lead acid accumulator that needed charging on a regular basis. Bath time was in a tin bath in front of the fire, we always had plenty of coal though because dad worked at Ormonde pit. When the coal delivery came it would be tipped in a pile on the lane and I would help dad barrow it up the allotments to the coal shed, which was at the front of the house. I remember the farmer George Searson delivering milk to the residents. It was done from the back of a small van and delivered straight from the churn into whatever receptacle you had. He would park his van near No 1 and we would take it in turns to fetch the milk in a white pot jug. Those who lived at the far end of the row would have to carry the milk all the way back without spilling any or you would find yourself in ‘hot bother’. I had plenty of mates living on Daykins row and we would spend many a happy hour playing in the fields and lanes on the other side of Nottingham road, known as the Dumbles. By the late 1950s Daykins Row families were being re-housed and we were moved to a house on a new estate at Aldercar with Electricity, Gas, back boiler central heating, even an inside toilet… what luxury. Fig.3 George Benton stood at the front door of No. 4 Daykins Row. Probably dated mid 1950s. A history of much interest could be written of the inhabitants of this little row of houses, and the odd one or two at the further end. Small as these houses were, with the little strips of garden in front of them, and limited convenience at the back, occupied by some ten or a dozen families, they were ever full of unfolding human life. Whilst many began and ended their existence in this out-of-the-way secluded cul-de-sac, it was the birthplace and breeding ground of some local intellectuals. Excepting that it had a fair open outlook over fields towards Woodlinken and the Hill top, what there could be in this drab, cramped up bit of territory, creative of moral goodness, ambition and intellectual development, it is difficult to imagine. I can only account for it in the God-fearing, law-abiding, home loving, and in most instances rather more than averagely intellectual parentage. The most pleasurable memory I have of this annual feature is that, they had the biggest bonfires here on Guy Fawkes nights of any in the locality. As most of the boys' fathers and brother's were pit workers, there was always a plentiful supply of gunpowder and the laying of long powder trails, the firing of rudely made cannons, the letting off of squibs, the roar and blaze of a great fire, and the roasting of potatoes, made this an outstanding event; in fact one that we boys made preparations for weeks before-hand. Boys and girls, big and little, and. their collier brothers and fathers, all joined in the glorious November 5th celebrations. Had the folks of Daykins Row lived anywhere else or further apart, they would doubtless have grown up differently. Whilst. a few possessed but fair average intelligence, their chief recreation and ambition being pigeon flying or to play an instrument in the local brass band or chapel service, nevertheless a dominating aspiration towards intellectual achievement pervaded the locality, which seemed to have had a leavening influence over the less ambitious, making them better than otherwise they would have been; and so Daykins Row might claim to be a centre of serious thought, and it could boast of more earnest chapel goer's than any other row of its size. During periods of religious revival, which occurred fairly frequently, Daykins Row folk could be counted on for their religious fervour and stirring emotion. Nearly all of them were enthusiastic chapel folks, but it was not only in religious zeal that they shone; deep down in their natures there was a strong underlying trend in intellectual directions, coupled up with ambition, earnestness, and sense of duty and moral obligation. These qualities were not confined to one family alone; they spread and found root in others. Old Mr. and Mrs. Cooper, who lived in the first house,. were a devoted couple, worked hard for the chapel, and had an unusually intelligent family, all at whom were great readers, mostly self -educated, yet scholarly. Samuel Cooper, the eldest son, though all his life a collier, hankered after learning and moral goodness. He possessed one of the best up-to-date libraries, and whilst culturing himself, He did commendable service for the Sunday School and chapel. I have had the pleasure of many edifying conversations with him. His brother John, a scholarly youth, who attended Cross Hill school at the same time as, myself, became a pupil teacher, and later a schoolmaster of repute. The Weldons, living a door or two away, were also an intellectual family; the father had a very capable, practical mind, was a good chapel goer, and two of the sons, John and George, who went to Ripley school when I did, became schoolmasters. Then there were the Johnsons. John James was one of my Ripley schoolmates; also the Thorpes, Selstons, and the Beardmores, and the parents of a youth we called Prince Albert, another Ripley schoolboy, and further along two bachelor brothers, one of whom played the violin particularly well, and was in the chapel band. These Daykin Row people, progressing from one generation to another, by their exemplary characters and conduct, have usefully contributed to and influenced the life and intellectuality of the village, and so made it better for the rising generations. 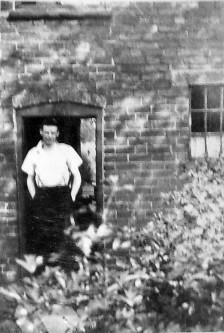 Another interesting personality, who was akin to and lived with one of the Daykin Row fami1ies, and would be appreciatively remembered by the older generations, was Johnny Shaw, an old miner, bent double with work, and who walked painfully along with a stick. He was a dear old man between seventy and eighty years of age when I was at Cross Hill school, and he loved all children. He worked at Waingroves pit" had learned to talk a little French, and as he wended his way home, resting here and there on a stile, we school children would gather round him, and persuade him to count up to twenty in French. This he would do in an inimitable way, beginning slowly, beating time with his hand, and finishing up very rapidly, to our intense amusement. Occasionally, with further persuasion, be would repeat this queer sounding, rhythmical little recitation, which none of us understood, and which we regarded as very wonderful. It is intolerable to think that a decrepit man of his age should have been allowed to work long hours in the pit. All his life old Johnny Shaw had been an earnest chapel goer, the good influence of which should have sweetened and consoled his declining years, but tragedy came in his wake at the last. He was an exceedingly sensitive man, and because of some misunderstanding in connection with his family affairs, in a moment of unreason he threw himself down a well, where he died, a deplorable ending to a busy life of toil and plodding, and one so religiously sincere and highly respected. Before leaving Daykins Row I would like to relate a little incident, which occurred when I was littlie more than seven years of age. I happened to see some boys going to a field at the further end of Daykins Row. They said they were going to the Band of Hope treat. I walked along with them, and they were let in at the gate, through which I could see a lot of children and grown-ups playing games and having tea. I asked to join, but the sturdy Youth minding the gate said that before I could go in I should have to be teetotal. "What is that? " I inquired. "Oh!" he replied, "you never have to drink ale, or stuff as makes you drunk." If that is all, I told him, I would be teetotal. Still, he would not let me go in, but he said I could join on the next Friday. When the day arrived, I tidied myself up and went to the field again, but found nobody there. I returned home very disappointed, when my sister said: "You silly boy, it's the chapel vestry you have to go to." So I went at once to the chapel vestry, and signed the pledge, which I kept until long after thirty years of age. Also many Thanks to Dennis Robinson and Jeff Marriott for their help with the above information.